No, it wasn't that sort of rock trip. In August 2016 I was invited to create a Canada 150 public artwork. The question I asked myself is what sculptural form would best translate 150 years of Confederation and create an engaging piece of public art for people who come to see it? It was an interesting challenge. The call for proposals came while I was in Portugal on a family holiday. Not the most opportune moment, but being so far away had its benefits. Distance highlights the differences, accentuates what you miss about your home and what is special about it. I immediately thought about the vastness and character of Canada, its land and seascape. That led me to the other “Scapes”, - the “Human landscape” of diversity of Canadians, the historical and geological ones. Thinking about all the layers and richness of Canada’s “landscapes” was the foundation for the Sentinel Sculpture. Most of my projects involve community engagement and this one was no different. Although not obvious at first, a key part of the artwork for me was the “treasure hunt”, both for the rock, and meeting the people who helped me on the way. I met a lot of Canadians who felt real excitement that their local rock was going to be a part of a public artwork in Edmonton. When I first envisioned “Sentinel”, I assumed sourcing the rock would be easy; after all we have a lot of rock in Canada. In fact, incorporating rock from every province and territory in Canada turned out to be an almost impossible task. When I started to seriously research this project I discovered that over half of Canada's rock quarries have closed over the last ten years. Many provinces don’t have any working quarries left; if you can find rock, it tends not to be near industrial areas with transport and lifting equipment. So how does one flip from impossible to doable, accessing all shapes and sizes of rock and ship it to a cutting facility all within a modest art budget. It was only possible because of the dedicated help I received from numerous individuals in every part of Canada. The provinces with quarries were a relatively easy source– although most don’t open until the snow melts. Nunavut and the North West Territories, although they are mineral rich were especially difficult. Nunavut only has expensive air transport for most of the year (with a few month by sea). I spent endless hours searching the web, calling geological survey departments, miners, prospectors, rock clubs and more. Through each of these “treasure hunts” a few individuals caught the excitement of the project and helped connect me with people who could get things done. 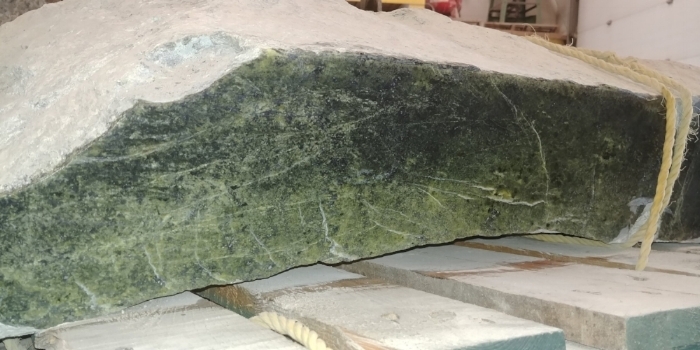 Special people like Mike Beauregard (Nunavut, Resident Geologist) who went out of his way to get some “hard to secure” green Serpentine (commonly called soapstone). He introduced me to Jerry Ell an Inuk rock carver based in Iqaluit. Jerry was amazing, a “can do” guy who managed to source stone and ship it to me (check out stone from Nunuvut – great story). Another extraordinary person was Joel Jackson, the General Manager of Dalvay on the Sea Lodge in PEI. I was in PEI at my wits end trying to find rock – I spent hours researching, emailing and calling potential leads. The only rock I was able to find was crumbling red sandstone, iconic but too soft to use. Joel suggested using old foundational stones and offered to make some calls and email me with his findings. I was on my way to Charlottetown when I got a call from him; he had located some stones and the owners were on site to show me them. I did a u-turn and headed back to Rustico district (Anne of Green Gables land) to be presented with a choice of intact, hundred year + old sandstone blocks. So, apart from the creative challenge of the sculpture, it was the people, land and a deeper understanding of ancient, geological time that made this project so memorable for me. Nunavut: The first rock I received was from Nunavut. I started researching months ahead and realized that although the north is rich in incredible rock – sourcing it and shipping was an almost insurmountable task. Access to Nunavut is either by air or by ship, so even if I found suitable rock getting it out was going to be a challenge. My luck started to change when Walt Humphreys, a prospector out of Yellowknife, suggested contacting Mike Bureaguard, Resident Geologist of Nunavut. As luck would have it Mike had recently completed a survey of carving stone quarries in Nunavut . He suggested I contact Jerry Ell, an Inuk stone carver in Iqaluit. Jerry was the key. He knew of a stockpile of green Serpentine (its usually erroneously labeled as soapstone) at Russell Chisholms - a local guy who quarries rock from the Tatsiituq quarry, Aberdeen Bay, on the south coast of Baffin Island, 2 days by boat out from Iqaluit. As the rock is hand quarried getting a piece long enough was tricky but Jerry found one, cut off the wastage and air shipped it to me via First Air. When I picked up the rock from air cargo, all the First Air airline agents had to come out and see this small but valuable cargo strapped securely to its own pallet. It was not their everyday shipment. Quebec: Once the snow finally melted I headed East to visit the Quebec quarry and rock plant that would be cutting and surfacing eastern rock sourced from non-quarried rock (boulders). First stop was Montreal to join fellow artist and good friend Guy Lavigueur who offered to be my driver, photo/videographer, interpreter and fellow adventurer. We headed out to Polycor’s Rivière-à-Pierre quarry, just north and west of Quebec City. Nick toured us around the quarry and the rock plant. I LOVE commercial quarries. It’s a sculptors dream! The scale is magnificent, the vast walls of stone with ribbons of water demarking the wall textures, the colours, the geometry – fantastic! They're like massive abstract paintings. The plant was great and the quality of the stone mason workmanship inspired confidence that they could handle almost anything I could throw at them. Which turned out to be a 3 ton+ boulder of green Virginite from NL. We spent the night in Quebec City, sampling Quebec bistro fare (amazing) and walking through some of the most important locale of French/English Canadian history well into the early hours of the next day. Back to Montreal in time to find out my 1 ½ hr flight to Deer Lake was cancelled and I was rerouted through Toronto and Halifax…. I would arrive 16 hours later, at 1AM at the Deer Lake airport – no friends, no hotel, and a closed car rental agency. Not an attractive option. I pushed for another option - not perfect but I ended up overnighting in Halifax and arrived Deer Lake the next day mid morning. I paid for the hotel (thank you Air Canada). Newfoundland/Labrador. Deer Lake is in Mid NL, about ½ hr. from CornerBrook. I met Jamie Meyers in Pasadena, a small town between Deer Lake airport and Cornerbrook. Jamie is like the pied piper of rock. He is a geologist that trained at the U of A (same years as my husband), but ended up in NFLD, one of the hot spots of rock diversity in Canada. He has done just about everything in the hard rock field but his obvious love is minerals. He owns a small shop, Meyers Metals, that sells rock and jewelry – specializing in local stone. In the back workshop there is stone everywhere! Boxes and stacks and layers. A “short” tour ends up as a fascinating four-hour introduction to the “Meyers world of geology”. Jamie’s passionate about the history and beauty of rock…- (as I am becoming). Millions, sometimes billions of years, are flying by depending what we are looking at. At the very end of the tour I suggest we should look at potential rock for the project. So far I’ve seen samples of phenomenal looking rock but all way too small for my needs. He leads me across an immense industrial open area onto a local road and eventually we find a series of large boulders placed along the side of the road. They had been there for some time. Small evergreens were growing from under them, Lot of grass and indigenous shrubs naturalizing them to the verge. I’m wondering if I have finally passed “the test” and he has decided that I am worthy of receiving his treasured rock, which turned out to be two to three ton boulders of Virginite from north central NL. They were extraordinary, apple green with yellow quarts veins running through. I can only describe as a Baroque. Wild, ornate - its geological origin boldly written into the vein patterns. It matched and surpassed my first NL choice, the beautiful, but elusive Labradorite. I then headed for Gros Morn National Park. An artist friend, Lyndal Osborne, had completed an artist residency there a few years ago and raved about it. What I encountered surpassed even her description – wild, beautiful, isolated. I took an afternoon hike in the Tablelands: barren, with snow mainly gone from the meadow and hills, although still a trough of it funneling down a creek-bed. Oddly enough, the only people in the parking lot were snow boarders. They climb up the hill and board down the ribbon of snow along the creek run. Tourist season has not begun so I virtually have the place to myself. This was a luxury; to be solo and have time to simply connect with nature. I stayed over night in Woody Point, a picturesque little seaside village tucked into an inlet where the Minke whales feed. The Bonne Bay hotel opened for the season the day before. Lucky me. From the barrens in the afternoon to seaside walks in the evening. Stunning perfection. At one point I found myself in the Deer Lake airport. It's typical of many small relaxed regional airports in Canada. In the quiet of that lonely outpost I happened to glance up from reading my book to observe the security lineup. 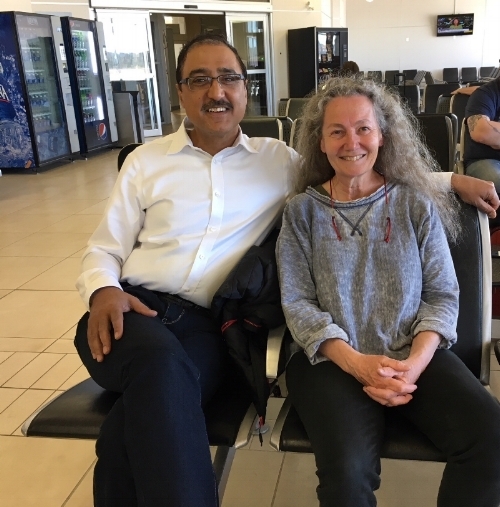 I was shocked to see what appeared to be my old friend and present Federal Minister of Infrastructure Amarjeet Sohi quietly standing in line. The circumstances were so bizarre, the location so out of the way that my mind wouldn't accept it, it simply couldn’t be. Must be a “clone of his” but wow what a look alike. I know Amarjeet from his days as an Edmonton City Councilor. He is very supportive of iHuman, an arts based charity for vulnerable street kids and where I’m chair of the board of directors. It turned out that Amarjeet, as the Minister of Infrastructure was visiting NL and he had stayed in Gros Morne Park the night before. He too had fallen in love with it. So we spent a happy ½ hr. catching up on all the exciting things that we were both involved in. Afterward he headed to Ottawa, while I continued my rock odyssey onto New Brunswick. New Brunswick: I had been trying to arrange a visit to the Brunswick quarry for about two months without success. I figured if nothing else I would just turn up. Luckily, I managed to get through to the appropriate person and it was arranged on the spot to visit the quarry right after lunch. Only 30 min from Moncton, the Brunswick quarry was just what I was looking for. I was greeted by Harry, who showed me around and introduced me to a beautiful dusty red colored stone. I realized at once that Brunswick limestone would make a good addition to my selection of rock - which was just as well because there is no other working quarry that I could find in NB. It was another indicator of the changing face of quarried rock in Canada. With globalization of the economy, the quarry business has steadily migrated out of Canada to China and South America for cheaper stone. We have an incredible quality resource of rock in our backyard but no one it seems, is willing to pay for it. After that experience it was back to Moncton for me. I picked up an old friend at the airport who was joining me on the Maritime journey and we headed to La Maison Mer de Cocagne, in Cocagne, a charming B&B. This was another grand house with an interesting past. Unbelievably, this massive house was moved to its present location from an offshore island a few miles away. This being Canada, the community simply waited until winter freeze up and then rolled it miles across the frozen bay on logs to its present site. Interesting history as in its present location it was a convent before becoming a B&B. This is a fascinating part of New Brunswick. It turns out it’s a pocket of Chiac speakers. This language is a quirky hybrid of Acadian French, English and Indigenous languages, filled with a mix of new and archaic words, all pronounced in a thick Acadian French accent. Seems not many outsiders of either language can understand it. Fiercely protected and most curious, recently has seen a surge of popularity in the youth in NB and Quebec. It reminded me of the Cockney language in London - proud and completely impenetrable. Prince Edward Island: From New Brunswick it was over the Confederation bridge - something I’ve always wanted to do. This bridge is a marvel, and much more impressive than I thought it would be. It was positively surreal to be driving so high above open water for so long – it felt….. almost floating. The only thing that reminds you that you are on an actual bridge is the constant vibration from all the traffic. It creates a type of rhythmic tempo of movement. PEI is like another fairytale world. Its like a little England – but so Canadian. The landscape and history tell of early immigrants who have farmed and fished for over 400 years. It just feels different. Its early European history inhabits it, the island is green, well groomed and planned. The soil bright red and fertile and appears to be one big stretch of continuously eroding sandstone which, as pretty as it is, presents a problem for me. There is no solid bedrock anywhere – not in the countryside nor in the sea cliff faces. At this point I was getting desperate and quite frankly I’ll take anything…..a granite boulder left over by the glaciers, a seam of solid sandstone or anything that looks like I could cut it. I spent over four months trying to get a lead on suitable rock. PEI is an anomaly in Canadian geology – the harder bedrock so common throughout the country doesn’t really exist here. After many frustrating attempts I finally connected with John Calder in Halifax who is writing a book on PEI geology. He told me that historically there were sandstone quarries in PEI (talking a hundred years ago)– so he figured there must be some sandstone that is strong enough for the artwork. My first lead. But how to locate it?? As we were booking into a B&B, I told my tale of woe to the helpful owner, which in turned, gave me some historical building leads but no quarry locations. There were not many restaurants open as it is pre-tourist season but I heard that Dalvay-on-the-Sea was open for dinner. Sylvia and I headed over to what I thought was simply going to be a good dinner, but it actually turned out to be the key to finding the PEI rock. Dalvay-on-the-Sea is a stunning lodge-style hotel. It's a beautiful period building with quality interior woodwork and huge open fireplaces. It reminded me of the historic lodges in the Rocky Mountains out West. Touches of luxury, preserved period architecture in a stunning location. One of those places that just feels right. A retreat for body and soul. We returned the next day and my friend Sylvia happened to mention our difficulties to the hotel's General Manager, Joel Jackson. He said "no problem, I’ll get you some names who can help.” He recently had his hundred-year-old barn foundation replaced. Large sandstone blocks were originally used. He thought old foundation stones were the way to go. Sounded promising – at least another avenue to search. We said goodbye and headed out to Charlottetown. Within ½ hr. Joel called and said “I have your stones”. The owners were on site and we could look at them immediately. I made a fast U turn and off we went back to Avonlea and to PD Construction. Charlotte and her young son Wyatt greeted us. Wyatt has impressive energy and provided a non-stop commentary about the stones, his climbing abilities, the cost of living in PEI and life in general. He was a hoot. They were very accommodating, allowing an Alberta artist to arrive out of the blue and climb over a small mountain of red rock. I picked out two of the largest and solid sandstone blocks, quarried hundreds of years ago. Perfect! Mega kudos to Joel who personally took the time and effort to help me with my project. and to Brenda, Craig and Wyatt for supplying the sandstone. It helped to create an “I love PEI and its people” memory. We then made a quick stop at Charlottetown in order to visit the public art gallery. Banners were everywhere about Canada 150. No wonder – it’s a key part of its history. Sadly the gallery was in install mode so limited exhibits. We headed to catch the 4:30 pm ferry from Wood Islands PEI to Caribou, NS. Nova Scotia: After overnighting in Wallace, NS, a small seaside town (established mainly for the quarry), we met with Tom Flynn whose family had been working in and with the quarry for generations. Great guy. Toured the plant first and then drove us into the quarry area. What history! As well as the “always interesting geological history” – the architectural history tell rich tales of these communities. Wallace sandstone was used widely in substantial buildings in Halifax and the North East US. It has a long and respected history. And have I said Tom is about the nicest and most helpful guy you could meet? As a rule all the quarry guys are. People who like stone…really like stone and most are “salt of the earth” types of people. Wallace sandstone is simple, elegant and strong. It will make a solid addition to the sculpture. With all my business is done, I had an extra day before my flight to Edmonton so we headed to the Bay of Fundy to experience a 14 ft tide (bucket list - check). Incredible! Stayed in Parrsboro, a small but absolutely beautiful town with just enough of everything to be livable, and preserved historic architecture to give a feeling of place. Had a great meal at a little bistro – first day open for the tourist season and met some locals who invited us to come back and stay with them if we passed through again. Way to make an impression! And to make a memorable visit even better I had my fresh lobster feed at a simple, on the sea café. My entire time in the Maritimes I had been hoping to indulge in a simple – serve it as it is, lobster meal but I was always a day early or a day late for the community lobster evenings and the restaurants would offer with sauces etc. I wanted to simply taste the sea unadorned and in Parrsbough I got to do exactly that. Yukon: Flying into Whitehorse is memorable. Turquoise waters punctuate the wildness landscape. I had no idea it was so mountainous. The Yukon is another part of Canada I have always wanted to visit. Nature in its majestic glory surrounds you. I had booked into an airBnB but once there, I was dying to camp. It draws you in – the scenery is so breathtaking I wanted to be closer to it. Whitehorse turned out to be a goldmine, in more ways than one. I had been talking to Sid, a rock supplier with a company called Sidrock. If Jamie Meyers is the pied piper of rock in the East, Sid is the man in the North (and much further). He has a workshop/rock plant in the industrial area in Whitehorse. His bread and butter is tombstones and kitchen countertops but his passion is rock – all types of rock. It was like being a kid in a candy shop. After travelling all over Canada looking for interesting rock – I had hit the jackpot. Sid collects and sells rock from around the world. He thinks nothing of going out and collecting a few 5 T boulders. If he’s on a trip and sees something interesting – he’ll ship it home. It could be 5 pounds but more likely a ton. He started to show me around and it turned into a four-hour whirlwind discussion and viewing of extraordinary rocks. Rocks you would find in a Natural History Museum (whom he sells to). But these rocks are raw and large and stunning. He shone black lights on some of the stone – they glow! Not a little but psychedelic style. And then we looked at what I could get from the Yukon….. Although I don’t need a lot of rock for each layer – it does have to be cut in fairly long lengths – which if cutting from a boulder can present problems of supply. Rhyolite was the answer – a swirling, distinctly grained, purplish stone with sparkling flecks. On the off chance I asked what else he had from other provinces. He showed me pyrrhotite (tungsten) from NWT and Nephrite (jade) from BC. I had been trying to track down jade for months and had accepted defeat but Sid had boulders of it from Dees Lake, Northern BC. Jack pot!. Not only did Sid have extraordinary rocks in stock he could also cut them on site. Although I was disappointed to not head up to Yellowknife to work with prospector Walt Humphreys to select and secure my NWT stone, I was satisfied that I had acquired the best stone for the artwork. So many more stories– including one about a lovely and industrious Saskatoon geology student name Rebecca who talked her father into renting a bobcat to move a granite boulder out of a field and onto their front driveway so that a tow truck could haul it onto its flat bed and get it to my truckers OR When I met Louis and Brenda Kamenka, who own and operate a family Rundle stone quarry in Canmore Alberta. Louis is the passionate steward of mega tons of magnificent rundle stone, brimming with fossils and “fleur” patterns. And a final acknowledgment of all my other travel experiences – that always included extraordinary Canadians from coast to coast to coast. I tip my hard-hat to you!